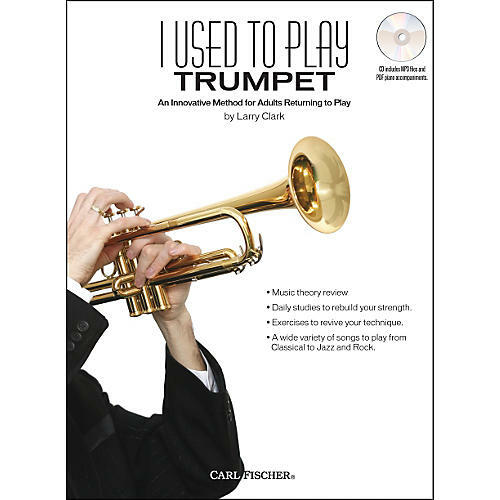 A book and MP3 method with accompanying audio and PDF files for adults returning to play the trumpet. I Used to Play Trumpet is an innovative book for adults looking to get back into playing their instrument of yesteryear. First and foremost, this trumpet book is meant to get people reacquainted with their instrument by providing them with the types of music they want to play. I Used to Play Trumpet contains a wide variety of trumpet music in varying styles, including pop, jazz, and classics, giving trumpet players countless hours of enjoyment. The enclosed CD contains audio MP3 files of complete performances of each song, plus versions of their accompaniments without the melody to make playing along even more satisfying. The printable PDF files of the piano parts on the CD can be used to play with a pianist friend, giving even more performance opportunities. I Used to Play Trumpet is a jump-start for former players wanting to get comfortable again with their trumpet. Did you used to play the trumpet and wish you could pick it back up? Order today and make it easy.